NOTE TO READERS:This is the final part of a three-part monthly series commemorating the 40th anniversary of the most momentous events of the summer of 1969. Max Yasgur's dairy farm in Bethel, New York is gone now. Only a small sliver of land remains owned by the family of the farmer who 40 years ago consented to the use of his alfalfa field by a group of rock music concert promoters led by Michael Lang, John Roberts, Joel Rosenman and Artie Kornfeld. Little did Yasgur -- or anyone else -- realize it at the time that he and his farm would become legendary in the annals of rock and roll history. A permanent amphitheater now sits where 40 years ago this weekend, some 400,000 mostly long-haired, blue-jeaned and tie-dyed young people gathered for three days of love, peace and music amid massive traffic jams, torrential rainfall and huge quagmires of mud. If you're just under 40 years of age and reading this, it might blow your mind to know -- unless they've told you otherwise -- that your parents might have conceived you while cavorting among the multitude of blissed-out "flower children" at what was officially billed as the "Aquarian Music Festival" -- but the world will forever remember by a single word that, to this day, evokes wistful memories: Woodstock. In many ways, Woodstock was the perfect counterpoint to the seething anger that was roiling the nation over the Vietnam War and the rise of "Black Power" militancy in the African-American community following the assassination of Dr. Martin Luther King Jr. 16 months earlier. For Lang and his partners, three-day festival almost didn't happen: The town of Woodstock, New York was deemed by the promoters to be too small to accommodate the expected crowds and the authorities in the nearby towns of Saugerties and Walkill firmly said "no." The promoters, operating under the name Woodstock Ventures, originally envisioned the event -- formally titled "An Aquarian Exposition" -- to take place an industrial park in Walkill, which they already had leased for $100,000. The company made assurances to Walkill officials to limit the expected crowd to 50,000 people -- roughly equivalent to a sold-out New York Mets baseball game at Shea Stadium. But the proposed concert drew immediate opposition from local residents, alarmed by the prospect of 50,000 young people descending upon their town -- prompting the town council to pass an ordinance requiring Woodstock Ventures to obtain a permit for any gathering of more than 5,000 people. Ultimately, the planned event was banned by the town's zoning board, on the grounds of public health; officials insisted that the portable toilets that Woodstock Ventures had rented for the concert did not comply with the town's health ordinance. But the real reason for the ban had more to do with clashing cultural values than anything else. 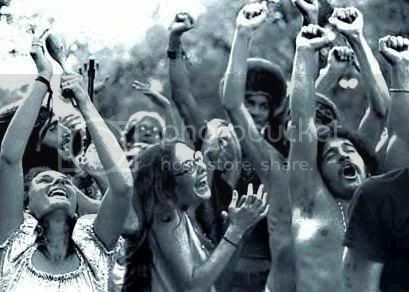 In a lengthy article published in 1994 in the Hudson Valley Times Herald-Record to commemorate the 25th anniversary of the Woodstock Festival, Elliot Tiber, who owned a resort in the nearby town of Bethel, recalled that the residents of Wallkill "had heard of hippies, drugs and rock concerts . . . [and] Woodstock Venture's employees sure looked like hippies," with their now-iconic long hair and scruffy, hand-me-down clothing. As far as the mostly conservative townsfolk were concerned, Tiber wrote, "Long hair and shabby clothes were associated with left-wing politics and drug use. The [hippies'] new ideas about re-ordering society were threatening to many people" -- especially in the wake of the violent clashes between police and the mostly young anti-Vietnam War protesters at the Democratic National Convention in Chicago the previous summer. Tiber, meanwhile, had received a Bethel town permit to run a music festival at his resort. "I think it cost $12 or $8 or something like that," he wrote. "It was very vague. It just said I had permission to run an arts and music festival. That's it." After learning that Walkill had rejected Woodstock Ventures' request to hold their concert there, Tiber contacted Lang and his partners. It quickly became clear that Taber's 15-acre resort was much too small for what Woodstock Ventures needed. But Taber had a friend who owned much more acreage. Enter Max Yasgur, who owned a 600-acre dairy farm in Bethel, located about 40 miles southeast of the original site that would eventually give the three-day festival its name. Or, more accurately, Yasgur's young son, Sam. The younger Yasgur told the Sullivan County Democrat that the Yasgur farm was struggling amid one of the rainiest summers in Sullivan County's history. “It was so rainy that summer, we couldn’t get the crops in,” Sam Yasgur told the newspaper. And having been denied permission to hold the festival in Walkill, Lang and his partners were scrambling to find another site. Besides, Sam loved rock and roll. And so Sam lobbied his father to rent their alfalfa field for the concert. Max Yasgur ultimately agreed, seeing an opportunity to tide the farm over financially. The Yasgurs expected a small concert, attracting 10,000 people at best. Little did they realize that they would end up hosting a multitude of more than 400,000; from August 15 to August 17, the tiny hamlet of Bethel became the Empire State's third largest city. All roads leading to Bethel were solidly gridlocked -- which, if Arlo Guthrie was being accurate when he announced it to the rain-soaked, mud-caked crowd after he was helicoptered in -- led to the closure of the New York State Thruway. And the rains kept coming -- turning the site literally into Mudville. Lang and his partners were expecting up to 250,000 people to show up. The actual turnout of nearly twice that many took them -- and everyone else -- totally by surprise, so much so that, to avoid the event becoming a total disaster, the promoters decided to make the festival "a free concert." Lang was quoted in Taber's 1994 article as saying that he never precisely made the decision that Woodstock would become a free show. But he did decide to make the announcement from the stage -- which was captured in the documentary film that was released a year later. " It was kind of like stating the obvious," he said. The promoters really had no choice. They couldn't have stopped the thousands of gate-crashers even if they wanted to. "How can you to tell 200,000 to 400,000 people, 'Go home, it's over?'" Lang said. "It would have been the riot of the century." But something remarkable happened: Instead of crying foul, the thousands who paid their way in didn't complain. It seemed that nothing -- not the rain, not the mud, not the massive traffic jams, not the overrunning of nearby stores -- could dissuade the multitude of music lovers and blissed-out hippies from taking in and enjoying the scene. The music was what mattered. As the only reporter at Woodstock for the first 36 hours of the festival, Barnard Collier of The New York Times was almost continually pressed by his editors in New York to make the story about the immense traffic jams, the less-than-sanitary conditions, the rampant drug use, the lack of "proper policing" and the presumed dangerousness of so many young people congregating there. In remarks posted on Wikipedia, Collier recalls: "Every major Times editor up to and including executive editor James Reston insisted that the tenor of the story must be a social catastrophe in the making. It was difficult to persuade them that the relative lack of serious mischief and the fascinating cooperation, caring and politeness among so many people was the significant point. "I had to resort to refusing to write the story unless it reflected to a great extent my on-the-scene conviction that 'peace' and 'love' was the actual emphasis, not the preconceived opinions of Manhattan-bound editors," Collier continued. "After many acrimonious telephone exchanges, the editors agreed to publish the story as I saw it, and although the nuts-and-bolts matters of gridlock and minor lawbreaking were put close to the lead of the stories, the real flavor of the gathering was permitted to get across." Collier concluded that after the first day's Times story appeared on the newspaper's front page, "the event was widely recognized for the amazing and beautiful accident it was." Remarkably, there were only a few arrests, mostly for drug possession. There were, however, two deaths -- one festival-goer was killed when a tractor ran over the sleeping bag he was sleeping in, and the other died from a heroin overdose. But those two deaths were offset by two pregnant women giving birth at the site. Four decades later, Woodstock remains a cultural touchstone for millions of Americans of the Baby Boomer generation, thanks in large measure to the 1970 documentary film. By now, it's cliche to say, "If you remember Woodstock, you weren't really there." There is some ring of truth to that, as there as many different stories about Woodstock told by the 400,000-plus who were there. In 1997, the site of the concert and 1,400 acres surrounding it were purchased by Alan Gerry for the purpose of creating the Bethel Woods Center for the Arts. The center opened on July 1, 2006 with a performance of a most un-Woodstock-like group: The New York Philharmonic Orchestra. Just over a month later -- 37 years almost to the day after their historic performance at Woodstock. Crosby Stills Nash & Young performed to 16,000 fans at the new amphitheater. A visitor to the concert site today will find a plaque commemorating the festival. The field and the stage area remain preserved in their rural setting. On the field are the remnants of a neon flower and bass from the original concert. In the middle of the field, there is a totem pole with wood carvings of Jimi Hendrix in the middle, Janis Joplin on top, and Jerry Garcia on the bottom. A year ago, a museum opened containing films and interactive displays, text panels, and artifacts -- including a replica of Ken Kesey's psychedelically-painted bus, "Furthur" -- which explore the unique experience of the Woodstock festival, its significance as the culminating event of a decade of radical cultural transformation, and the legacy of the '60s. Although officially named The Museum at Bethel Woods, it will likely be forever known as the Woodstock Museum. With the 40th anniversary of the Woodstock Festival this weekend, Bethel is already overrun with visitors -- including a flood of media people from around the world -- many who attended the festival and wanting to take in memories of that magical weekend and many others -- too young to have been there -- wanting to catch at least a glimpse of place that, for some, is hallowed ground. And the visitors are likely to run into a portly man with a shoulder-length white hair and an equally long white beard. No, it's not Santa Claus, but rather Duke Devlin. He's one of a handful of Woodstock festival-goers who never left town. Devin, now 66, owns Duke's farm Market in nearby Jeffersonville with his wife. But he's better known today for his other gig: "site interpreter" for the Bethel Woods Arts Center -- and the unofficial curator of the Woodstock museum.